Sheep-Isle has a propensity of islands inhabited by sheep and surrounded by the sea. Perhaps the most classic one in the Nordic Countries is Lilla Karlsö, situated half an hour by fishing vessel from the south-west coast of Gothland, Sweden. Sheep-Isle disembarked a late evening early August – an evening, when sheep were silhouetted against the Nordic evening sky – a classic atmosphere on the isle. Sheep has properly been grazing there since the Bronze Age. Lilla Karlsö is a nearly circular isle of limestone, approx 160 ha. The isle consists of a high plateau of limestone, around 50 meters above msl. The plateau which is nearly flat is bordered by steep cliffs. There are several caves, and up to 16 meter limestone pillars. 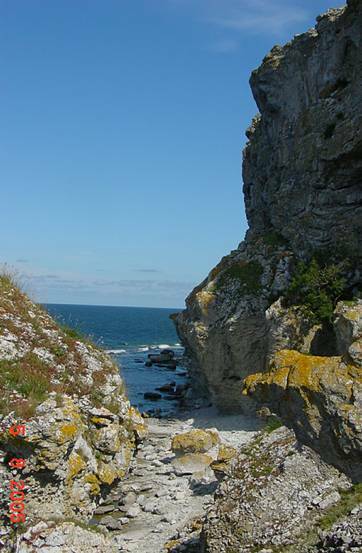 In the north and south there are a more or less wide coastal grassland, but in the west the cliffs fall directly into the sea – typical bird-cliffs. Lilla Karlsö has a status as nature reserve, and you are only allowed to visit the isle when guided. The flora consists of approx. 350 species. Today there is an amazing balance between the different species because of the sheep grazing – a balance which certainly has existed in thousands of years. The island is mostly known for its rich birdlife and flora. There are colonies of common guillemots and razorbills. There are also several very rare plants for Sweden, such as Lactuca quercina (called 'Karlsösallat' in Swedish language), spleenwort hart's-tongue fern and Petrorhagia prolifera. 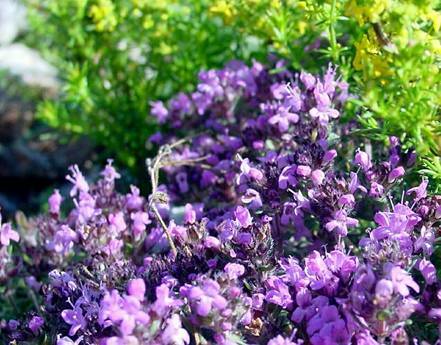 Since 1954 the island has been owned by the “Swedish Society for Nature Conservation” and it is now a nature reserve. During summer there are tour boats from the fishing village of Djupvik. Drawing by Måns Hjernquist – at that time 13 years old. 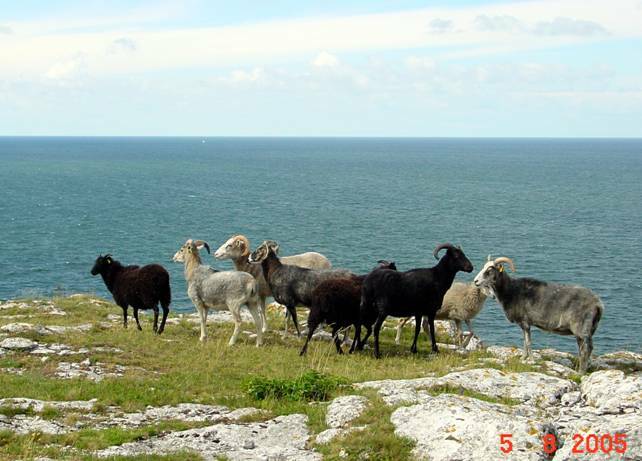 Lilla Karlsö is an exceptional result of natural grazing by sheep. The gute sheep is a direct descendent of the Bronze Age sheep, and grazing has been going on continuously since that time. The level of grazing has of course changed during time. Recently there has been some turbulence about grazing, mostly stated by politicians and authorities – both without any local knowledge of isle and sheep. Thanks to the Hjernquist family, Ann-Catrin, Björn, and their son Måns, and backed up by “The Swedish Society for Nature Conservation”, Lilla Karlö is today in a steady balance. Sheep-Isle, who has been visiting smaller and bigger isles nearly everywhere in the Nordic Countries, is very impressed by the high reverence, by which the Hjernquist family is managing the isle and sheep – expressed by one word: Balance. Early morning trip a little flock of gute sheep seeking seaweed washed ashore during the night. Anyway the brackish water of the Baltic Sea is important. Sheep need water and salt. In summertime the grazing on Lilla Karlsö is carried out by approx. 130-150 ewes followed by their lambs, totally around 4-500 animals. In wintertime the ewes are grazing at the Hjernquist family farm on the mainland Gothland. At mating time in November, ewes are getting separated in small groups, each of them being presented to one of these imposing rams. In former days this “presentation” was natural and took place on Lilla Karlsö. But because of todays artificial restrictions, this is no more allowed. Today Björn together with wife Ann-Catrin, and son Måns, is doing the job. 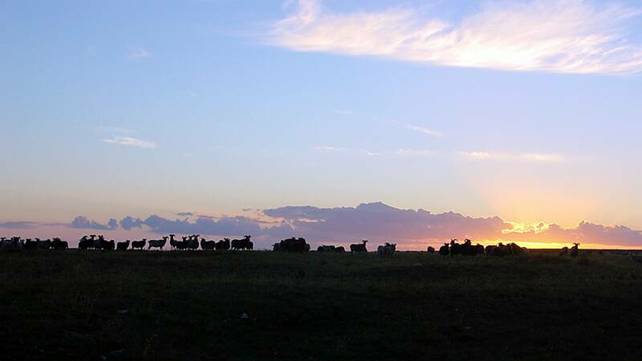 Their eyes and long experience is decisive to the future of the gute sheep and consequently to the historic continuity of natural grazing on Lilla Karlsö.